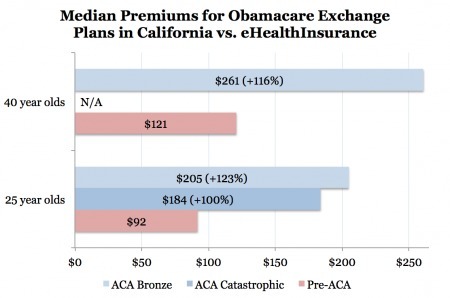 Apparently, those comparisons that claimed California insurance rates were coming down under Obama were bogus, essentially comparing apples to oranges. Except they're not cheaper than what's currently available, as Peter Suderman noted here yesterday. That directly relevant point is totally obscured by phony claims that “it is difficult to make a direct comparison of these rates to existing premiums in the commercial individual market." Essentially what is going on here is that Obama is touting a 5% drop in the price for a Ferrari, and hiding the fact that the Ford Taurus is going to double in price. Or worse, the Ford Taurus will not even be for sale, so middle class Taurus buyers will be forced to buy a Mercedes or Ferrari. Health care buyers don't care that a package of features is going to be a bit cheaper if they don't want those features. And recognize that the price increase for healthy young people who feel no need to buy a policy will be facing an infinite price increase, from zero to whatever he now has to pay. ObamaCare is a great example of planned obsolescence. It is designed to fail catastrophically. Obama and the Democrats hope the catastrophe will convince the citizens and residents of the USA (otherwise known as the saps) that insurance companies, hospitals, clinicians, over-users, fraudsters, Republicans, and Tea Party supporters are to blame. Thus, the great and powerful Dems must act immediately. Voila! By 2020 we have fully socialized "health care" spelled out in a 4,000 page bill that no one lifted, much less read. I have yet to see a substantive article that explains how Obamacare lowers, or raises, health care costs, or more exactly, private insurer monthly premiums. Gee, I wonder which rates AND coverage will default? 2. 2017 – after this year, no congressional committee, or other legislative body can revoke Obamascare. Ever. Which is highly unconstitutional, but who cares about that? There is one reason why you should oppose the proposed $5.3 billion Keystone XL Pipeline. And it has nothing to do with “green religionists,” as The Wall Street Journalcalls the opposition in today’s paper. Instead, it has everything to do with a foreign oil company using U.S. government power to force Americans off their land in the name of “eminent domain.” It has everything to do with putting a 78-year-old grandmother in jail, pepper-spraying protesters and using other bullying tactics that would make the Mafia proud. This pipeline would connect the oil and gas producers in Western Canada with various U.S. endpoints. There are all kinds of economic benefits for a new pipeline. You’ve probably heard about the 16,000 jobs, for instance. I’m not disputing the supposed benefits. The latter is what’s happening here. There have been many eminent domain actions against property owners in Texas, for example. One of the most famous is the case of the 78-year-old grandmother, Eleanor Fairchild. Police arrested her and threw her in jail for a night. Why? She was trespassing — on her own farm! A Texas court condemned the property at TransCanada’s request after she refused to sign over her property. They seized it anyway. You should look at the healthcare.gov site. At least for California, the plans in the exchange for plans for 29 and under where you have to pay the first $7500 on your own are more expensive than my full plan for a 46 year old. I agree that the plans seem to be 146% higher. I thank Larry as well for finally convincing me to look at his government propaganda site. I noticed since more of us have started looking and laughed at the "low cost plans" and other crap on the site, he stopped constantly bringing it up. Agreed, the system once in place will collapse in about 5 years. I think it will kill the hospitals first, so the government will take them over as they go bankrupt to save us. Then the private insurance will be forced under, and everything will be owned by the federal government and run by the federal government - the will have saved us from their mess. Government did this in several steps with student loans. First offer subsidies to banks, then cut the subsidies, then force below market interest rates so banks won't lend, and then taking over the whole program to save us as well. At let us not forget, it will be against the law to NOT purchase a Ferrari. (and, no, it's not "our care costs 10 times as much because it's 10 times better"). Are you talking about this planet, or your home planet?